Goal: Preserve and restore New Jersey’s ecosystems and the full complement of species that share the state with us. New Jersey is a state of great natural diversity, from the mountains and forests of the northern Highlands, to the vast marshes of the Meadowlands, the barrier islands of the shore, and the unique ecosystem of the Pine Barrens. Unfortunately, much of our natural heritage has been damaged, some of it for centuries, as we have dumped wastes on the land and in the wetlands, allowed human development to encroach on the habitat of other species, and spewed pollutants into our air and water. New Jerseyans have come to recognize the value of what we are losing, and are choosing to protect land from further development, clean up toxic wastes, conserve what is left of the Meadowlands, and designate more of our rivers for the highest levels of protection. These actions may show economic payoffs, as water treatment costs drop and property values rise with the cleaner environment. 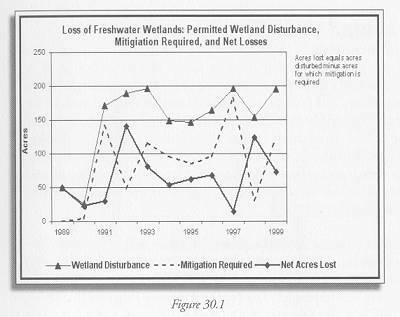 Freshwater wetland impacts of development have continued at the same rate throughout the 1990s. 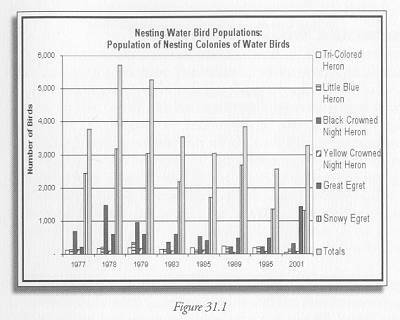 Nesting water bird populations have declined over the past twenty-five years. 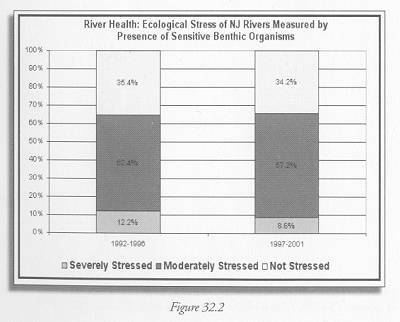 River health, based on measured dissolved oxygen levels, has improved in the past ten years. Marine water quality, as measured by the share of shellfish habitat that is safe for harvesting, has improved gradually over the past twenty-five years. Additional data on species diversity would be useful, so we could do better at tracking the impacts of our activities. 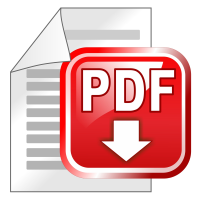 Data on human interactions with wildlife such as bear and deer may also be of interest. This information may help us find better ways to coexist with other species.